Traveling Route 66 with the windows rolled down is about as All-American as road trips get. But if you don’t have the vacay days for the whole trek, we found a little town that gives the perfect glimpse of the storied road, and can be seen in just a day. With Route 66 as its main street, Williams is a little mountain town nestled into one of the world’s largest Ponderosa pine forests, and it’s about as quaint as it gets—just picture a train track set come to life. 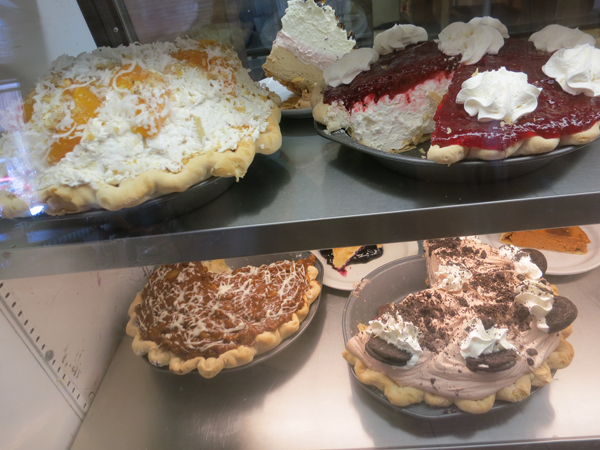 With lace curtains, checkered tablecloths, and a front-and-center display of pies, Pinewood Country Restaurant is the homiest spot in an exceptionally homey town. We stopped in for breakfast and found some surprisingly healthy options—the “Veggie Light Omelet,” for example, is made with low-fat cheese and egg beaters—alongside hearty standbys like hotcakes and biscuits and gravy. At the in-house coffee bar, Giddy Up N’ Go, the latte is called the “Annie Oakley,” while the espresso shot is known as the “Clint Eastwood. For dinner, Rod’s Steakhouse has a hard-to-beat, classic steakhouse vibe. Founded in 1946, the place is decked out with cows. Cute likenesses of the bovine creatures decorate the dishes, a stained glass window, and even the menus are cow-shaped. (Go ahead and ask your waitress if you can take one home—they’re popular souvenirs.) Along with steak and all its traditional sides—baked potatoes, green beans, tossed salads with perfect Ranch dressing— the menu has Rocky Mountain Trout, Fried Chicken, and Barbeque Ribs. Don’t miss the little honey pots on each table, meant for drizzling the warm, fluffy rolls that come out before the meal. Of course, chowing down isn’t the only thing to do here. Williams is known as the “Gateway to the Grand Canyon,” since it’s less than an hour away. Make an easy daytrip of it by taking the Grand Canyon Railyway to and from the natural wonder. The vintage train leaves from the Williams depot each morning at 9:30 a.m.; by 5:45, you’re back in Williams. The train has on-board buffets, historical reenactments, and seasonal specials like a “Polar Express” trip during holiday season. If you’re taking the trip, stay at The Grand Canyon Railway Hotel. Owned and operated by the railway, the place is just a block away from the depot and two blocks from the cute shops and restaurants lining route 66. Modeled on a century-old depot hotel, the venue has clean, comfy rooms with triple-sheeted beds, coffee makers, and bathrooms stocked with custom products in vintage packaging. There’s also a game room with pinball and video games, a fitness center, and an indoor, saltwater pool and hot tub. If you stay here, be sure to grab a drink at Spenser’s Pub. 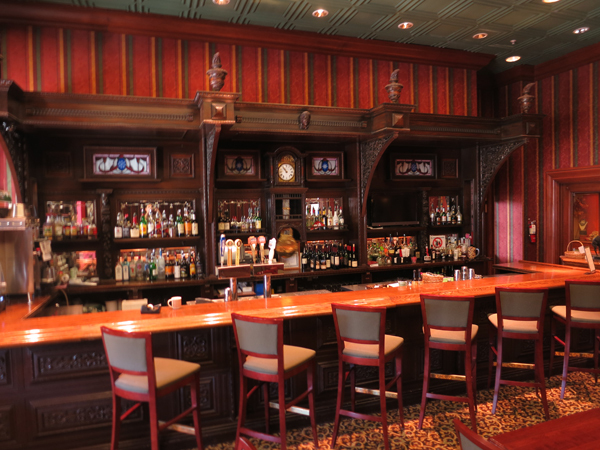 Just off the lobby, the stately restaurant has a towering bar—really worth seeing— that was handcrafted by an English cabinetmaker in 1887. The bar’s headpiece was modeled on the cabinetmaker’s mistress, and legend has it there’s a secret compartment holding a gift for her. 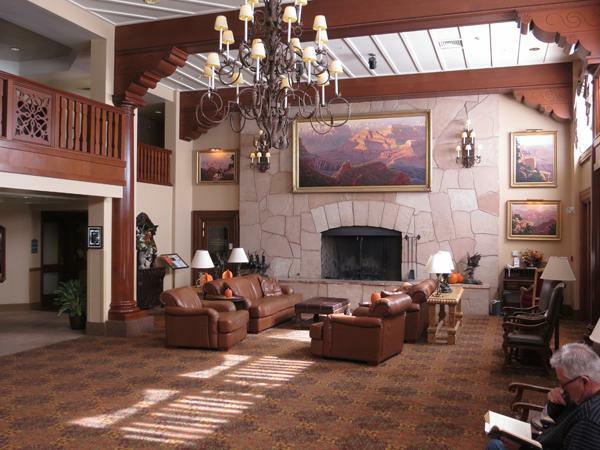 *Top photo of the lobby at The Grand Canyon Railway Hotel. All photos by Dustin Berta.